Dog eared copy of Agatha Christie's ''They Came To Baghdad'' with all sorts of odd paper scraps tucked between the pages...my grandfather's; the man from whom I inherited an unquenchable thirst for reading! Love sagas, old and new continues in my other blog! A Bangla word, kosha means well fried, mangsho means meat. This is a recipe in which the masalas, the chicken pieces and the rest of the ingredients are well fried over low to medium heat for about 20 to 30 mins. A matter of patience, probably best tried over the weekend. 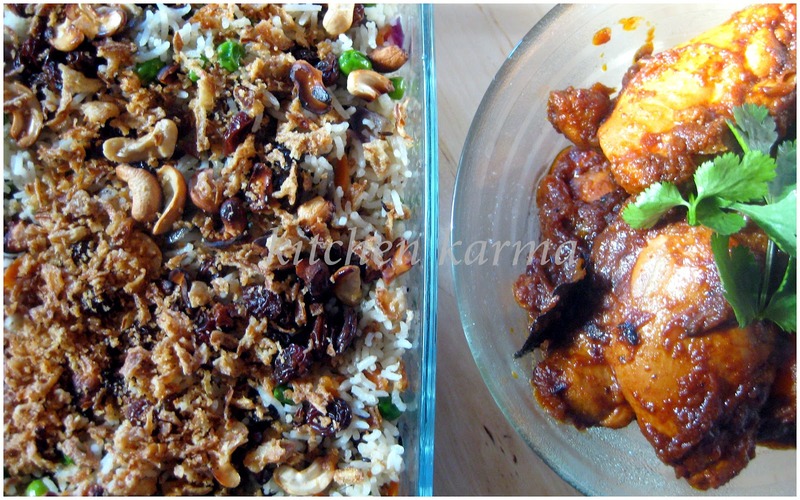 This dish is generally prepared in Bengali homes when we expect guests. Make the oil screaming hot, reduce the heat and add the garam masalas and the red chillies. [Chances of the garam masalas burning are high, so I take the pan completely off the heat and then add the garam masalas.] Immediately add the chopped onions and the sugar. The sugar is added at this stage because it caramelises and gives the onion a lovely reddish brown colour. Put the pan back on heat. After 5 mins or so add the masalas, fry till the oil starts to separate on the side. At this stage add the ginger and garlic paste and the tomato purée. Again fry till the oil starts to separate from the masalas. Takes roughly 5 mins or so. Add the chicken pieces and the potatoes. Now begins the test of your patience. Keep frying this on low/low medium heat for about 20 to 30 mins. You can slowly see the chicken pieces and the potatoes changing colour. The remaining fat on the chicken pieces will melt and add to the gravy. If you are lucky enough to use farm fresh country chicken without a trace of fat, then you may need to add a few drops of water, so that the masalas do not dry up. After about half an hour or so when the chicken pieces and the potatoes look nicely brown, add salt to taste. The reason salt is added at the very end is because salt releases water from the chicken and we do not want that before this. Then add just about enough water to submerge all the pieces and let it cook, covered for another 20 mins or so. Keep checking and stirring occasionally. Most of the water should evaporate and the gravy should be almost dry-ish and thick. Turn off the heat and keep the pan covered and let it rest for 10 mins or so. In the Indian subcontinent we do not rest food much after it is cooked. But we have noticed that if rested, especially meat preparations taste better. Leftover curries are way tastier than freshly made ones. Our hunch is that over the resting period the masalas get time to incorporate into the meat! So if expecting guests you can prepare this a day ahead. You can serve this with plain rice or rotis/parathas (Indian breads). 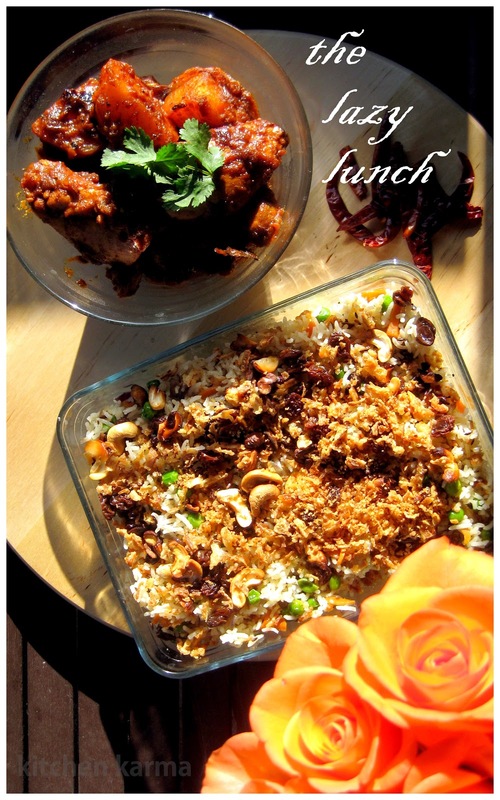 Tastes best with the sweet Bengali polao (fried rice). 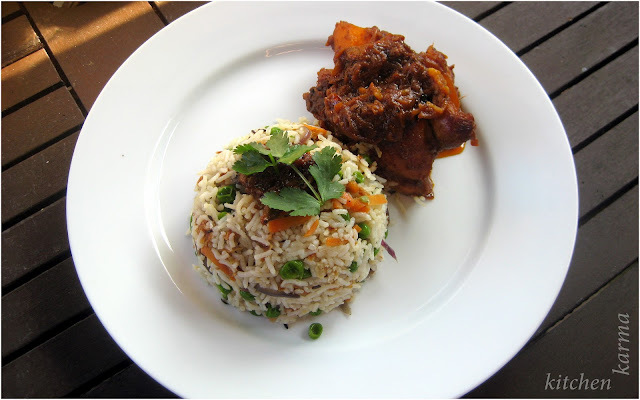 The heat of the dish nicely balances with the sweetness of the rice. I had some leftover rice, so used that to make a simple fried rice, throwing in whatever veggie was there in my fridge. Used only some cumin seeds to fry the veggies with, garnished with some fried cashew nuts and raisins and my latest find ready-made fried onions! A simple Indian salad of cucumbers, tomatoes and onions with a sprinkling of lime juice, diced green chillies, chopped coriander leaves and rock salt goes nicely with this. nice !! love the write up !! ABSOLUTELY adorable !! I love chicken curry! Your pictures are wonderful as always! I am salvating just looking at it! Suchi, such a wonderful post! Lovely write up n yummy yum chicken,just drooling ..
Nice write up Suchi, beautiful roses and a wonderful lunch I guess..
Hey Suchi, your posts are fun and interesting to read. chicken curry looks tempting. Def a different one :).. loved it! i do share the first two things..love for reading & leather bags :D.. i see u are dabbling with photography too.. good clicks & have a great trip..cant wait to hear more! Simply yummy and delicious looking kosha mangsho. Lovely preparation. 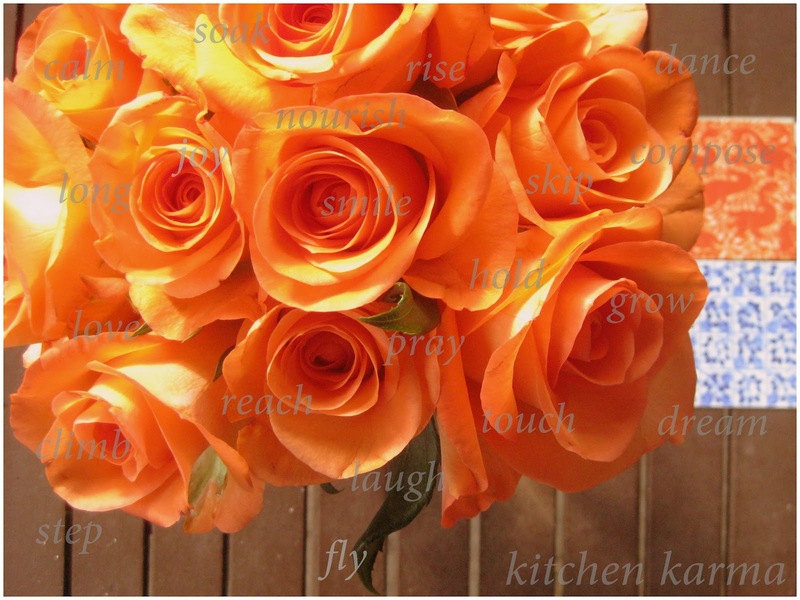 Love the write-up Suchi...adore the gorgeous roses, and absolutely love the delicious chicken dish! Oh tat combo looks so delicious.. can u pass me the plate? 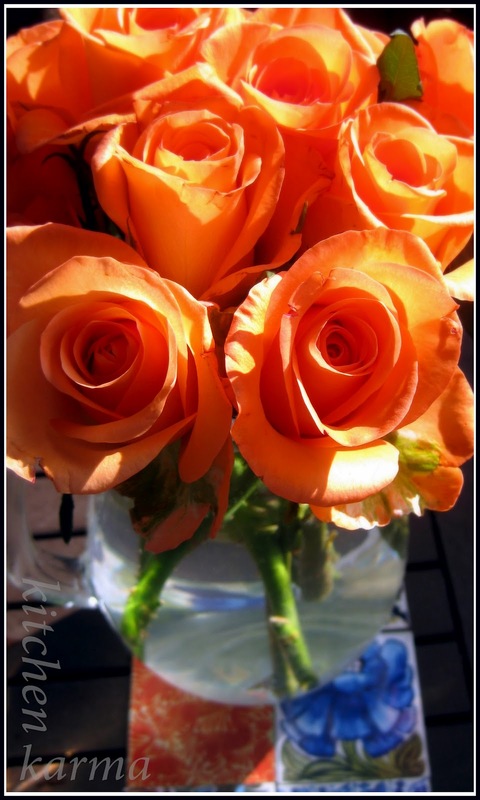 wonderful writeup and lovely roses !! I loved the write, reminds me of my collection of Asterix comics from time past and my new love for Nigella Lawson from time present. Wonder what time future holds.. Lovely recipe. Sounds yum..! I loved those orange roses and the mystery weaved into the 7 things about you. And thanks for the Bengali recipe, didn't expect it this soon. We eat lots of chicken and a new recipe is always welcome. Have a wonderful weekend! First of all, my apologies for replying back so late!Thank you so much for thinking about me and very kind of you to share the award with me...a heartfelt 'Thanks'! I have been away from my blog for sometime now due to a nasty virus attack and am depending on a borrowed laptop to reply to my blogger friends - I will try to get back soon and will definitely blog about the award once I'm back!In the meantime, the Kosha Mangsho was 'cruelly' delicious - in the sense that I stay too far from you to savor a bite;)Lovely read here!Enjoy your weekend dear!! I love Indian food, all the spices and herbs that are used in your recipes are delicious. This recipe sounds so delicious! Thanks again! Hi Suchi, you have an award waiting for you at my place.. Came over here through Jaya's blog. The kosha mangsho recipe is a keeper! What a lovely post. This is my kind of food! That chicken curry looking finger-licking good! Awesome feast here, not sure which would disappear first the chicken or the rice dish! Curry is definitely getting more popular at my house, most likely because of all the awesome recipes I am finding and yours is no different. Thanks for popping by my blog today, enjoyed the visit here. Thank you for visiting my blog. What I see here is really good. Your blog is so interesting! Great photography, great recipes and interesting posts! I am a happy follower now! Nice meeting you. Enjoyed your post! Lovely pics...golap golo mone hocche ekhuni kichu bolebe! 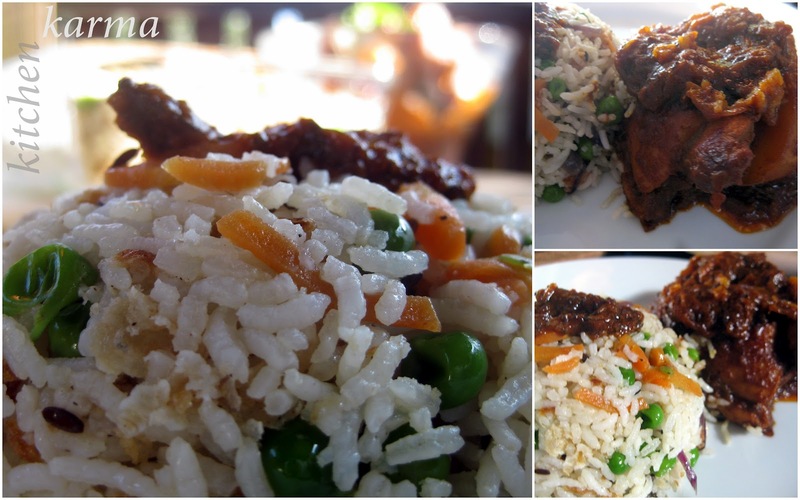 Kosha mangsho ar pulao eta to Bangalir favorite Sunday treat! Tomar ranna ar presentation dekhe mone hocche jomiye khete boshe pori...simply lajabab! Super tempting chicken curry,looks so delicious. I glad to follow you. wow..this absolutely fantastic!! Your clicks make it more tempting!! !